Summertime is upon us, and once again we will be burning up our barbeques and grills, charring meats and vegetable to fill us up during these long, lazy days. 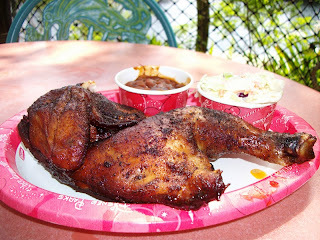 There is a place in Walt Disney World that similarly desires to heat up slabs of chicken and beef, Flame Tree Barbeque. Today we take a taste drive of the Smoked 1/2 Chicken. The half a chicken, no skimping on meat here folks, is paired with a dab of baked beans and a few bites of coleslaw. That is to say, while the main course is a generous portion, the sides are a bit skimpy. Both have great flavor to them, especially the kick of the beans, but you will be left wanting more. Good thing there’s enough chicken to go around! The chicken is slow smoked and tender to the fork. The rub used on the meat is a delicious concoction that stimulates both the sweet and spicy centers of the tongue, making your mouth water for more. Since it is half of a chicken, there are ample portions of both white and dark meat, allowing guests to dive head first into their preference while the meal is still hot. This is a warm, melt in your mouth dish that you will not regret taking a chance on. What makes the chicken, and for that matter all of the meats of Flame Tree, so delectable is the special rub that has been applied generously. Over three years ago, I revealed the recipe for this rub, but perhaps it is time to revisit this great barbeque component. I keep a batch of this rub handy at all times, and can testify to how it has granted me Grill Master status around my family. It is easy to put together and stores well in a mason jar. When applying the rub, make sure it has some time to really soak into the meat before you toss your chicken, ribs, or other meats on the grill. My DH has been wanting the recipe for that rub for years!!! Question, is that a typo for the sugar, 2 pounds seems like allot! Also, what kind of sugar, white or brown? Thanks!